I think many women have a tendency to fear and to worry. It’s just a part of who we are. We may have witnessed a terrible tragedy that makes us more fearful for the safety of our own family. We may have stressors and worries in our life that cause us to be fearful. Is fear itself a sin? I don’t think so. It’s a natural emotion that many of us have. Allowing ourselves to be overcome by fear and controlled by it, instead of trusting in God to guide us, is our own selfish and sinful behaviour. We fall into this very easily. It’s easy to get lost in the fear itself, it grips us and we stagger to try and control our situations so that fear can not creep in. A few years ago, a friend of mine confessed that she was struggling with fear. She had heard from a friend whose husband was killed in a car accident shortly after they were married. She mourned with her friend, but was also gripped with fear. With three weeks until her own wedding, she was terrified that her soon to be husband would be taken from her. Every time he left her, she was afraid. After they were married, if he would run to the store to pick up some groceries, she was afraid. The fear controlled her. After several months, she found she was making herself sick with fear and worry. She came to me asking what she should do. Little did she know that I also was struggling with fear, and had similar thoughts and worries over my own family. All I could do was pray with her, and share something that had been shared with me. 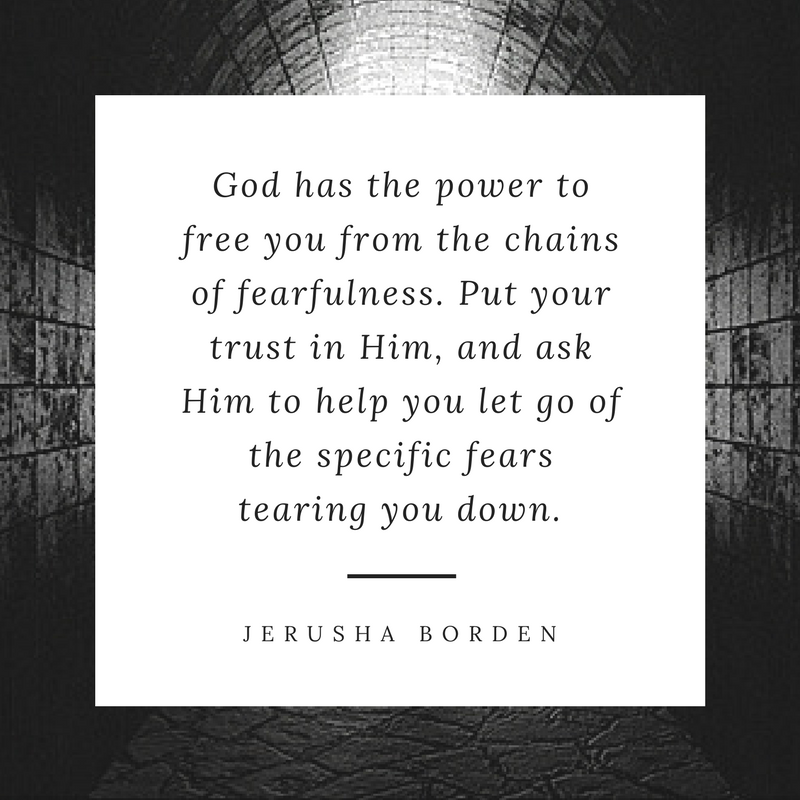 God has the power to free you from the chains of fearfulness. Put your trust in Him, and ask Him to help you let go of the specific fears and worries that are tearing you down. Like any sound advice, it is easier said than done. We continued to struggle with fears, keeping accountable to each other and praying for one another and ourselves. It is encouraging to be able to share the struggle with another Christian woman, because she understands my need to lay it down before the Father, who is more than capable of taking my fears away. Don’t let fear and worry overcome you. Look the One who can take them away, and trust that He has a plan for your life. Allow Him to lead you and guide you through it, trusting that He will be with you always.